The football box score hasn’t changed much over the past decade. Some of the basic stats listed from box scores in the 1930s — like total yardage and passing yardage — still appear today. But which stats are useful, and which are junk? Advanced stats expert Bill Connelly examined that exact topic in his recently released book, and in one of the chapters, he proposes a “new” box score. Basically, his goal is to leave in the important stats that are most telling while leaving out some of the garbage. For example, yards per play and possession are important, as they give some additional context in an age where some offenses are going faster than ever. Some other stats, like penalties (studies have shown penalty yardage does not correlate strongly to wins and losses) and time of possession (total plays is a better stat) are left out. • “Passes defensed” is the number of interceptions plus the number of pass breakups a team has in a game. About 21 percent of passes defensed are intercepted in college football, so this number can let us know if a team might have gotten a bit of luck in the turnover department. • In this box score, sacks are counted against passing totals. If you think about it, that makes sense, as negative yardage from a team trying to pass shouldn’t penalize its rushing numbers. Kansas safety Dexter Linton snags South Dakota recevier Terrance Terry by the jersey before bringing him down during the second quarter on Saturday, Sept. 7, 2013 at Memorial Stadium. Yeah, it’s only an FCS opponent, but KU’s pass defense still deserves praise for completely shutting down South Dakota. The Coyotes averaged just 2.8 net yards per attempt while managing only 55 net passing yards. 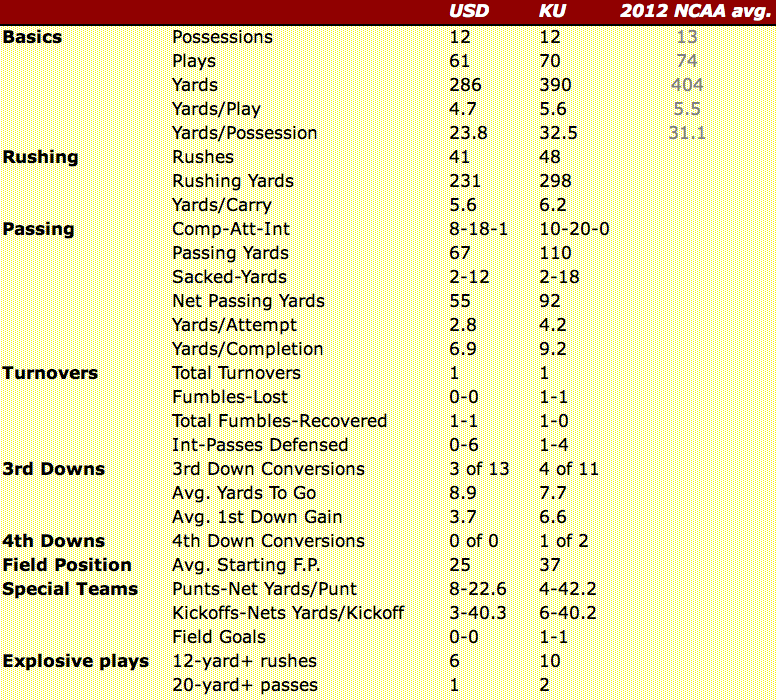 Those criticizing KU coach Charlie Weis for taking a 15-yard penalty to make it third and 19 in the fourth quarter only need to look to these numbers to see why he did it. USD had no chance throwing it against KU until that one particular play, where the Coyotes completed a 37-yard pass for a first down. The odds were in Weis’ favor when he accepted the walkoff. The Jayhawks’ 4.2 net passing yards per attempt has to be a huge concern considering KU’s opponents only will get tougher in the coming weeks. This wasn’t all on quarterback Jake Heaps, as he was victimized by a handful of drops on some well-thrown passes. KU’s yard-per-completion number wasn’t horrible (9.2), but the Jayhawks’ efficiency was hurt because of the high number of incompletions. Here’s a stat for you from Connelly’s book: In 2012, when two FBS teams played and one team had an advantage of 12 yards or more per drive in field position, that team’s record was 151-10 (.938). That stat held true Saturday for KU against an FCS foe, as the Jayhawks held a 12-yard advantage in the statistic, meaning special teams helped turn what could have been a close game into a three-possession win. KU’s biggest edge was on punts, as contributions from Connor Embree (four returns, 92 yards), Josh Ford (blocked punt) and Trevor Pardula (42.2 net yards per punt) gave KU a nearly 20-yard per punt edge over USD. 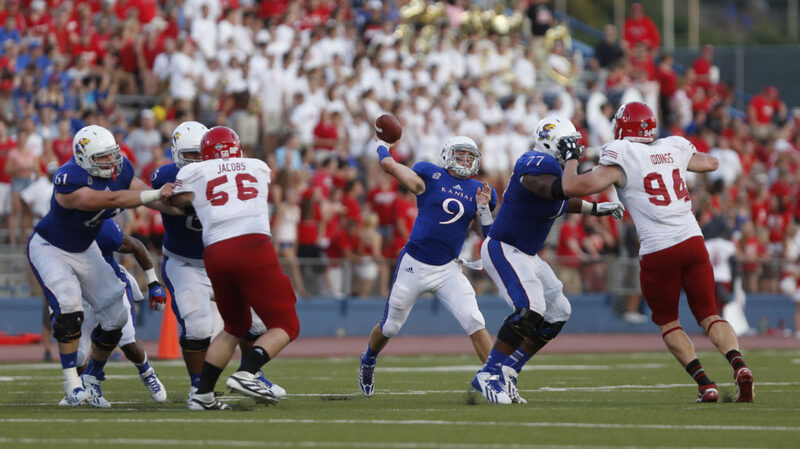 Kansas quarterback Jake Heaps turns to throw against South Dakota during the second quarter on Saturday, Sept. 7, 2013 at Memorial Stadium. 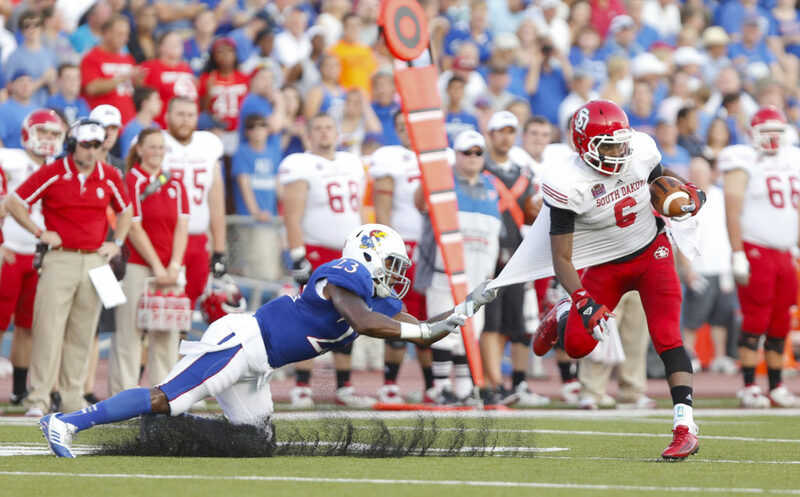 KU’s average third-down distance needed was 7.7 yards, which was higher than I’d have expected against USD. 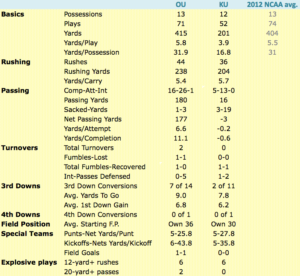 Though the Jayhawks averaged 6.6 yards on first downs, most of that success came in the second half. On 16 first downs in the first half, KU gained 71 yards (4.4 yards/play); on 17 first downs in the second half, KU gained 147 yards (8.6 yards/play). You could take this a few different ways. Maybe KU improved in the second half because Weis committed himself more to the run. Perhaps KU was the better conditioned team, and that played a factor late. Either way, KU’s 6.2-yard-per-carry average is a strong number, and with it, the Jayhawks should be able to avoid third-and-longs better than they did Saturday. The Jayhawks ripped off 10 12-plus-yard runs against USD, and five different backs had a 12-yard run of their own (James Sims, Brandon Bourbon, Darrian Miller, Taylor Cox, Tony Pierson). I’ve mentioned this before, but with so many options, there’s no reason for KU’s coaches to turn Sims into a workhorse back this year. The Jayhawks have enough talent to keep fresh legs on the field. You can see on the top that KU’s yards (404), yards per play (5.5) and yards per possession (31.1) all were almost exactly on the NCAA average from a year ago. That average, though, only reflects games between two FBS opponents. KU’s offense should have been expected to do better against USD, but as mentioned before, the Jayhawks’ lack of passing efficiency dragged all the numbers down. The 31 points scored Saturday had a lot to do with KU’s defense and special teams providing great field position and not necessarily the overall success of the Jayhawks’ offense. KU’s receivers and tight ends appear to have the most to prove heading into Week 2 against Rice.